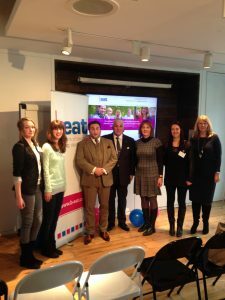 The UK’s leading charity supporting people with eating disorders, is now better placed to provide information and advice thanks to support from the Amy Winehouse Foundation. Launched to coincide with Eating Disorder Awareness Week, Beat’s brand new website is now able to offer excellent interactive help and support people and families battling anorexia nervosa, bulimia and other related mental health issues. Sufferers and their families looking for help will be able to access the site by smart phone or tablet, use message boards, take part in live chats and online support groups and search for local support services. This will deliver the charity’s core services 24/7 in a much more interactive way. What’s more, b-eat.co.uk will also appeal particularly to teens and young adults – a demographic of particular concern to us at the Amy Winehouse Foundation. Amy herself battled with an eating disorder and so her family felt strongly that the work done by Beat was something they would like to support. In fact, a brand new report from Beat (which shows that eating disorders ‘most frequently become apparent when people are in compulsory education’ and are under 16) chimes with the Amy Winehouse Foundation’s own experiences when delivering its Resilience Programme For Schools across the UK. And like Beat’s own report finds, the Amy Winehouse Foundation believes that the earliest possible interventions are the most effective when it comes to addressing a problem in someone’s life. That’s why this new website – which can quickly reach out to more people, with the most timely information and advice – is such an important tool. “B-eat’s work in supporting people affected by eating disorders is vital. We frequently encounter young people who are struggling with these issues in our own work with secondary schools, and understand just how terrible an impact an eating disorder can have on them and their family. That’s why it’s so important that anyone struggling with these issues is able to access information and advice as easily as possible, so that they can get the support they deserve’.